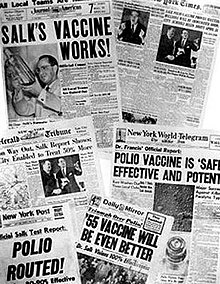 Jonas Salk (October 28 1914 – June 23 1995) was a medical researcher and author, the inventor of the Salk vaccine against Polio, and the founder of the Salk Institute for Biological Studies. I couldn't possibly have become a member of this institute if I hadn't founded it myself. I feel that the greatest reward for success is the opportunity to do more. Nothing happens quite by chance. It's a question of accretion of information and experience … it's just chance that I happened to be here at this particular time when there was available and at my disposal the great experience of all the investigators who plodded along for a number of years. Address on receiving the Nehru Award (10 January 1977), published in Virginia Woolf Quarterly (1977), Vol. 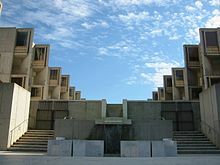 3, p. 11; also quoted in The Signs of Language Revisited : An Anthology to Honor Ursula Bellugi and Edward Klima (2000) edited by Karen Emmorey and Harlan L. Lane, p. 330; the last sentence is Inscribed in metallic lettering at the entrance of the Salk Institute in La Jolla, California. As quoted in Learning from the Future : Competitive Foresight Scenarios (1998) by Liam Fahey and Robert M. Randall, p. 332. Also as quoted in Edward Cornish, Responsibility for the Future, The Futurist (May/June 1994), p. 60. This bespeaks an entirely different philosophy — a different way of life — a different kind of relationship — where the object is not to put down the other, but to raise up the other. I have the impression that the new generation of young people, are coming up on the scene with a sense "ancestorhood", and with more wisdom than was evident before. I think this comes about as a matter of necessity — Almost as if there is something in us that is innate, something inherent in us, that is destined for a longer term, rather than a shorter term future. What is … important is that we — number one: Learn to live with each other. Number two: try to bring out the best in each other. The best from the best, and the best from those who, perhaps, might not have the same endowment. And so this bespeaks an entirely different philosophy — a different way of life — a different kind of relationship — where the object is not to put down the other, but to raise up the other. When things get bad enough, then something happens to correct the course. And it's for that reason that I speak about evolution as an error-making and an error-correcting process. And if we can be ever so much better — ever so much slightly better — at error correcting than at error making, then we'll make it. Responding to a question of whether he holds his views as a philosopher or as a biologist. Richard Heffner: You say "We can create ourselves and our future"
Salk: — by shaping our selves not our cells — thats the important distinction. … We are shaping our cells, but we will not change our selves in the course of shaping our cells. I look upon ourselves as partners in all of this, and that each of us contributes and does what he can do best. And so I see not a top rung and a bottom rung — I see all this horizontally — and I see this as part of a matrix. And I see every human being as having a purpose, a destiny, if you like. And what my hope is that we can find some way to fulfill the biological potential, if you like — the destiny that exists in each of us — and find ways and means to provide such opportunities for everyone. Now at the moment the world is suffering from large numbers of people who have no purpose in life — for whom there is no opportunity — and that's sad. There is something about human nature that has to be understood, and so … I've shifted my attention from an interest in unity to an interest in creativity. I already see enough evidence for this optimism … in recent years I find that perhaps what Im seeking is a scientific basis for hope, and I think I've found it. I was merely interested in things human, the human side of nature, if you like, and I continue to be interested in that. That's what motivates me. I was told I could, if I wished, switch and get a Ph.D. in biochemistry but my preference was to stay with medicine. And I believe that this is all linked to my original ambition, or desire, which was to be of some help to humankind, so to speak, in a larger sense than just on a one-to-one basis. Just as I intended to study law, to make just laws, so I found myself interested now in the laws of nature, as distinct from the laws the people make. Some people are constructive, if you like. Others are destructive. It's this diversity in humankind that results in some making positive contributions and some negative contributions. It's necessary to have enough who make positive contributions to overcome the problems of each age. We were told in one lecture that it was possible to immunize against diphtheria and tetanus by the use of chemically treated toxins, or toxoids. And the following lecture, we were told that for immunization against a virus disease, you have to experience the infection, and that you could not induce immunity with the so-called "killed" or inactivated, chemically treated virus preparation. Well, somehow, that struck me. What struck me was that both statements couldn't be true. And I asked why this was so, and the answer that was given was in a sense, 'Because.' There was no satisfactory answer. Why do I see things differently from the way other people see them? Why do I pursue the questions that I pursue, even if others regard them as, as they say, "controversial?" Which merely means that they have a difference of opinion. They see things differently. I am interested both in nature, and in the human side of nature, and how the two can be brought together, and effectively used. It's the sensitivity to pattern recognition that seems to me to be of great importance. It's a matter of being able to find meaning, whether it's positive or negative, in whatever you encounter. There are three stages of truth. First is that it can't be true, and that's what they said. 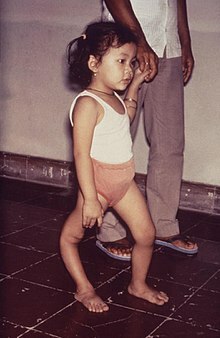 You couldn't immunize against polio with a killed-virus vaccine. Second phase: they say, "Well, if it's true, it's not very important. And the third stage is, 'Well, we've known it all along." You have to develop a thick skin in life. Its not in this field only. You might think of the ideal of the scientists, the ivory tower, the idealist. That's true of some. And I wouldn't guess as to what proportion. But there are some who are of that character, and there are some who are not. You can have a team of unconventional thinkers, as well as conventional thinkers. If you don't have the support of others you cannot achieve anything altogether on your own. It's like a cry in the wilderness. In each instance there were others who could see the same thing, and there were others who could not. It's an obvious difference we see in those who you might say have a bird's eye view, and those who have a worm's eye view. I've come to realize that we all have a different mind set, we all see things differently, and that's what the human condition is really all about. That's how we continue on, and will improve our lot in life, solve the problems that arise. Partly out of necessity, partly out of this drive to improve. Since whatever we do has to be part of a team, part of a community, we have to attempt to bring together those who have the same conviction, see the same things. Then it becomes a matter of time, when one or the other will prevail. Fortunately, there is all this diversity, and if not for that, problems would not be solved. The evolvers are people who cause things to change. The maintainers of the status quo do everything to keep things from changing. And, there I see differences of perception. Differences in vision. Differences in interpretation, and differences in temperament, in personality. The number of evolvers are much fewer than the maintainers of the status quo. And amongst the evolvers, there are some who are initiators, some who go along with what other people recognize to be new or different. I have come to associate a kind of success that we are referring to, to individuals who have a combination of attributes that are often associated with creativity. In a way they are mutants, they are different from others. And they follow their own drummer. We know what that means. And are we all like that? We are not like that. If you are, then it would be well to recognize that there were others before you. And, people like that are not very happy or content, until they are allowed to express, or they can express what's in them to express. It's that driving force that I think is like the process of evolution working on us, and in us, and with us, and through us. That's how we continue on, and will improve our lot in life, solve the problems that arise. Partly out of necessity, partly out of this drive to improve. Reason alone will not serve. Intuition alone can be improved by reason, but reason alone without intuition can easily lead the wrong way. They both are necessary. The way I like to put it is that when I have an intuition about something, I send it over to the reason department. Then after I've checked it out in the reason department, I send it back to the intuition department to make sure that it's still all right. That's how my mind works, and that's how I work. That's why I think that there is both an art and a science to what we do. The art of science is as important as so-called technical science. You need both. It's this combination that must be recognized and acknowledged and valued. I am interested in a phase that I think we are entering. I call it "teleological evolution," evolution with a purpose. I think of evolution as an error-making and error-correcting process, and we are constantly learning from experience. What you see in living systems, and in genetic systems, is that the genes are already there, having arisen in the course of time, and when they are needed they become activated. If they had to be invented, the time would be too late. By the same token, I think that the people who are needed to help guide the future already exist. They simply need to recognize this in themselves, react to the opportunities that prevail, and also be valued and be encouraged. It's that very large, and as yet amorphous, rung that is of interest to me. I hope to articulate this, and see to what extent it makes sense to others as well. Know what is the purpose of life that you are inclined to serve, that you are drawn to. Do what makes your heart leap rather than simply follow some style or fashion. Not everyone can or should be a scientists. Not everyone can or should be any one thing. People need to know what kind of purpose they can serve. The idea of being constructive, creative, positive, in trying to bring out the best in one's own self and the best in others follows from what I've just been saying. Again, I repeat my belief in us, in ourselves, as the product of the process of evolution, and part of the process itself. I think of evolution as an error-making and error-correcting process, and we are constantly learning from experience. It's the need to dedicate one's self in that way, to one's own self, and to choose an activity or life that is of value not only to yourself but to others as well. My life is pretty well at peace, and the profession is more of an avocation. It's a calling, if you like, rather than a job. I do what I feel impelled to do, as an artist would. Scientists function in the same way. I see all these as creative activities, as all part of the process of discovery. Perhaps that's one of the characteristics of what I call the evolvers, any subset of the population who keep things moving in a positive, creative, constructive way, revealing the truth and beauty that exists in life and in nature. I see weeds and flowers. I think of it in those terms, and we have to discriminate and distinguish between the two, to recognize and encourage those human qualities and attributes that are the more positive. Young man, a great tragedy has befallen you. You have lost your anonymity. This page was last edited on 12 December 2018, at 22:20.